there was a huge storm that hit our area on monday night. the skies opened up and it down-poured for a very long time. the torrential rain was accompanied by constant thunder along with lightning so intense it looked like there were strobe lights in the sky. as if that wasn't enough, huge pieces of hail started falling and hitting the house too. it was downright crazy. poor leko was scared out of his mind. it took a little while, but he eventually calmed down after the storm passed. 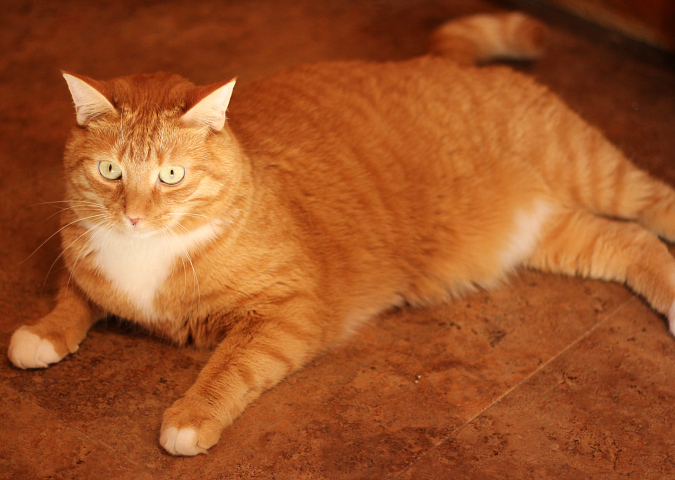 i couldn't resist snapping a picture of him lounging in a spot of sunlight on the kitchen floor. we sure love our little fur baby! We had a huge storm also but did not have the hail. Ginger was not thrilled with it at all, but Pepper did not mind it. We were glad for the rain, but hail is not good. Poor Baby wasn't sure what was happening. We got some rain, but not like you. It seems this summer the storms and rain are all around us and we have to water our plants everyday. We need a good soaking here.